Help your chiropractic patients with b vitamins for memory. According to recent research, one of those behavior changes may likely involve something as simple as taking vitamin B. Another B vitamin, vitamin B9—more commonly known as folate—has also been linked to memory too. Case in point: Research published in the Journal of the Academy of Nutrition and Dietetics looked specifically at three key B vitamins (folate, as well as vitamins B6 and B12) to determine what effect, if any, they had on the development of dementia later in life. In this case, researchers were unable to find a strong correlation between the other two B vitamins (B6 and B12) and a person’s ability to recall. Yet, it did make a connection between “folate intake below the Recommended Daily Allowance” (RDA) and increased memory issues as a person ages. The National Institutes of Health Office of Dietary Supplements reports that individuals 14 years old and older need approximately 2.4 micrograms (mcg) of vitamin B12 daily. This recommended amount increases to 2.6 mcg for pregnant women and 2.8 mcg for women who are lactating. To help you put this amount into perspective, the Office of Dietary Supplements explains that there are approximately 2.5 mcg of vitamin B12 in three ounces of tuna fish canned in water. And if you eat a bowl of breakfast cereal that has been fortified with just 25 percent of the daily value for B12, you’ll get more than half of your required amount of this brain-boosting vitamin (1.5 mcg). In fact, if you eat just three ounces of cooked beef liver, you’ll take in a whopping 70.7 mcg of B12 – an amount equal to more than 1,000 percent of your recommended daily value. Other foods which contain a good amount of vitamin B12 are trout (5.4 mcg per three-ounce serving), salmon (4.8 mcg per three-ounce serving), and haddock (1.8 mcg per three-ounce serving). There are also a wide variety of vitamin B supplements that can provide the same benefits but may be easier for your patients to consume. The Office of Dietary Supplements makes suggestions regarding folate intake as well. For individuals 19 years of age and up, this involves getting 400 mcg DFE (dietary folate equivalents) daily. Again, there are increased amounts for pregnant or lactating women, those being 600 mcg DFE and 500 mcg DFE respectively. In addition to being high in vitamin B12, beef liver is also high in folate, offering 215 mcg DFE per three-ounce serving. Other folate-rich foods include spinach (131 mcg DFE per half-cup serving), black-eyed peas (105 mcg DFE per half-cup serving), and, again, breakfast cereals fortified with 25 percent of folate’s daily value (100 mcg DFE per serving). Other foods that can increase folate intake are rice, asparagus, spaghetti, and brussel sprouts. 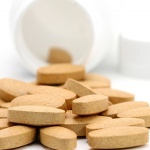 While some people prefer to get their necessary intake of these memory-improving B vitamins via supplements as opposed to foods, Nutrition.gov offers some advice if choosing to take this route. For example, because vitamin B12 can be difficult for individuals over 50 to absorb, taking this supplement in crystalline form can help the body better use it. Additionally, women who are thinking of becoming pregnant should increase their folate intake in preparation for the body’s needs when carrying the baby. This site also recommends consulting with your doctor prior to taking any supplement to better determine which ones are right for you.